Moving through time we imprint the moments of our lives and form journeys. Creating change, explorations, experiences that are forever remembered. Does the word journey bring up trips traveled and experiences you will never forget? Today I start on a new journey. A change in direction, a new collection of time that will form my future. Today was my first day of class for the MAT (Masters of Art in Teaching) at MECA (Maine College of Art). I am ecstatic, motivated, and grateful to be able to change my career mid life and get behind something I am so passionate about. The left side of my mind says, “why didn’t you do this sooner?” And the right side reminds me that life gives us what we need when we need it and this is the right time to invest in the education of our future artists and art lovers. To completely change my career and go back to school is so scary and makes me feel so vulnerable. But as my favorite inspirational writer Brene Brown would say, to swim in vulnerability is to live and grow. older paths to find these new ones and guide me. I think the most important thing we can do is be present on our current path. Pay attention to the detail around you. Feel the earth under your feet, the breathe from your lungs, and the birds overhead. Because this is your journey to remember and to imprint in your mind for your future self. What is your current journey? What path are you embracing? A relief from our frozen moments we have a high of 47 today. This girl hung out in her backyard with just a sweatshirt! I thought it was a great opportunity to get to the beach and breathe in some ocean air. I don’t know what has been in my isolated air lately but I have been so stuck in my thoughts. Don’t get me wrong, working through our thoughts are a good thing. It’s important to ask ourselves the why we do things and the why behind what we want. Getting behind the why helps us create the drive to accomplish things. I have been hyper focused on my thoughts to help guide me with my future. My current work situation is in a huge change and unknown future, which is creating me to rethink or develop my direction. Been loving all the mental work I have been doing and working to get more art infused into my days. But all this work has definitely put my brain into a funk. But what’s a great way to get out of a funk? Get outside! I forced myself to bring my sketchbook and not land on the good old excuse “it will be too cold” that I find in my vocabulary during these winter months. I was so glad I pulled it out and captured the quick sketch on the wind blown shoreline. Got some walking in to warm myself up and get my dog happy. Not a sketch to write home about, but it’s amazing what the mind captures when you are working to mimic the world around you. It’s like a meditation with pen in hand. Hyper focused only on the moment and sensing every detail around you. May we all just breathe in the moment and release our thoughts into the ocean air. Winter is in full swing in Maine. Winter began in mid December with a good dusting of snow, but then covered with rain. January gave us extreme freezing temps that even I started to get sick of them. I think my only response is cuddle and sleep. Got myself outside as much as possible, even though my internal core just didn't want to warm up. This year is making it hard to be my regular outside self. Always good to find yourself not as your routine self. Day after day I struggled to 'go big', first I thought it was my paint brush size, then maybe it was the paint? Questioning myself and realizing I was in full struggle, the cold set in and my motivation kept thinking about those blankets and warm bed to cozy up in. I have been listening to Better than Before by Gretchen Rubin and I must say this book is helping me get through my stuck. She talks about habits and how we end up creating our habits and how our personality type can really sway our habits a certain way. So many great tidbits about how to break or create new ones. A great new year/ new you book to reflect on your own personal habits and create new ones. Working to understand my personality better so I can understand my habit of having a consistent procrastination technique. At least I got some legs in my habit race, got one of these paintings done. 30"x30", not 8 Feet, but I will take what I can get. What's your habit that you are working on? Is it the end of summer? Or the beginning of fresh ideas and crisp energy? 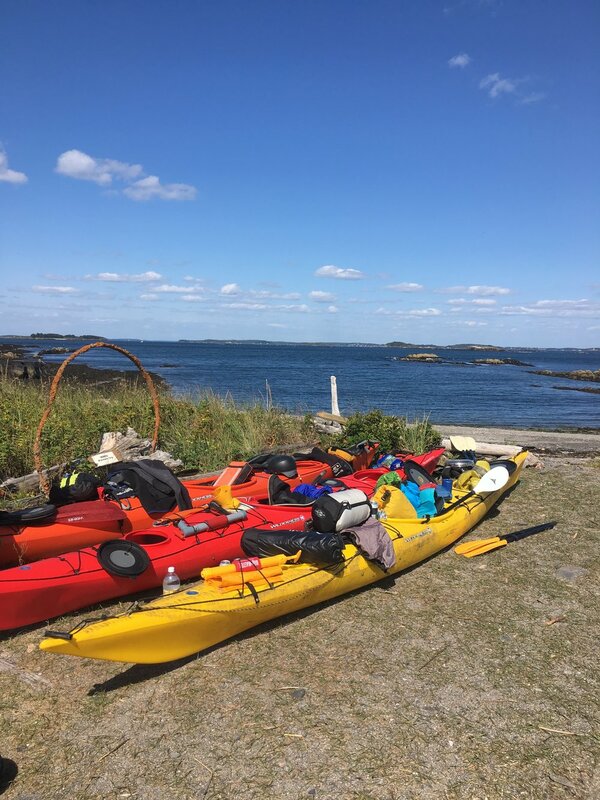 Every year I have been joining co-workers to trip a 3 hour paddle to Jewell Island in the Casco Bay of Portland, ME. I didn't make last year because it was too much after the passing of my dad. So back on another annual experience and it was just what my mental and physical doctor ordered! 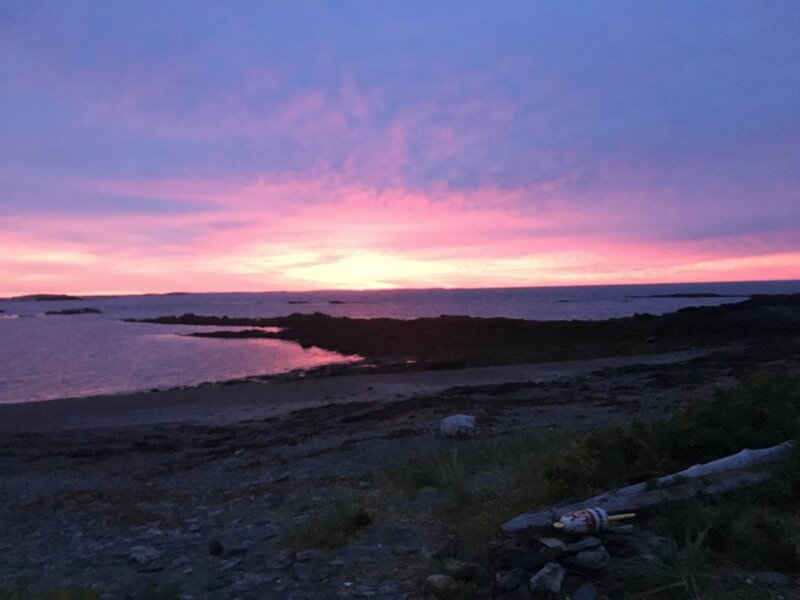 I love that the beginning of summer I was on Monhegan Island and have a great bookend of Jewell Island to the end. Even though the air has turned crisp and it feels like October, we have until the 20th to embrace summer. This cold snap is the awakening of our inner self to come abound. To stay in the present moment or flock away to a warmer place. I myself love the cold. I love the fleece jackets, the warm blankets, and renewed energy that the cold air brings to my soul. Our paddle to Jewell was not as smooth and easy as in times past. I had to whip out some bracing and paddling skills that my confidence is not up to snuff. Our launch from Cousins Island was high gusty winds that led me to struggle to keep my boat straight. Water was splashing on the deck, waves coming at me in all directions. I felt such a lack of control. I thought, I can't do this, three hours of this will not work. We came around the edge of Cousins and could see protected waters in sight. All I had to do was paddle to that and a breather was ahead. Frustrated with my boat turning the way I didn't want it, my shoulder starting to hurt, and exhaustion setting in I didn't know if I could do it. But I did! I made it to the calm. I expressed what a challenge that was and my co-worker stated that I looked so confident. We had a few more challenging terrains after that, but I was on fire! I had the energy and gusto to take anything on. It's amazing how we can be so buried in just trying to paddle through tough situations and not see how we could survive. How life can hand us challenges and in the end you get passed them and gain more strength. The hardest thing is seeing the flat water ahead. Breathe and hydrate is all I can say. I realized when my co-worker told me I looked so confident, that we all wear layers of blankets that might make things look easy. I am glad I took the time to express my struggles so my co-paddlers could understand they needed to remove the blanket. Many times in life our blankets might be telling someone a story that is no longer ourselves or what we want to wear. Sometimes we might be telling ourselves these stories and holding on to our blankets because it can be scary out there. With the chilly weather coming upon us choose what blanket you want. I am reaching for a new blanket. A blanket that will guide me into our winter with everything I need. A blanket to continue to focus on my needs first in order to give to others. A blanket of confidence, and the confidence that I know I have, not what others expect or see. What will you surround yourself with?